SX4750A ARIES; Smart Balance Swinging Bucket Rotor Assembly (without Bucket Covers), Stainless Steel/Aluminum. Major applications: Rapid sedimentation of protein precipitates, large particles, cells, and cell debris. Product Features: Automatically corrects imbalance -- up to 50 grams opposing loads, Cell Culture Flask Adapters, Modular Disk Adapters, Exclusive Aerosolve Canisters, Bottle Sleeves, Blood Bag Cups, Microplate Carriers Includes 4 round buckets, max capacity of 750 mL each. 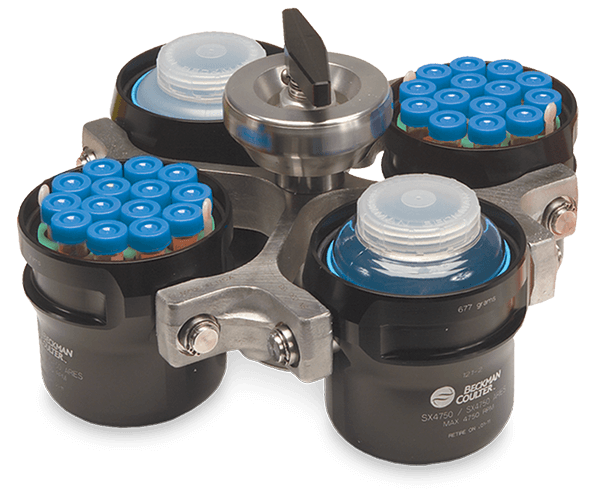 For use in Allegra X-15R, Allegra X-14, and Allegra X-12 Series centrifuges.